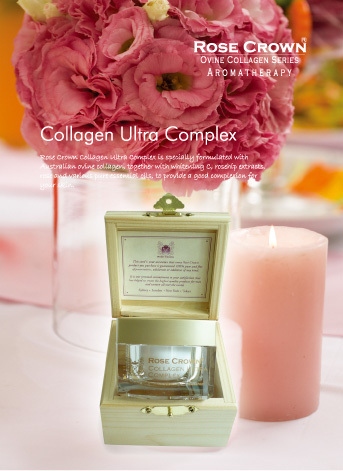 Rose Crown® has complete range of over 300 aromatherapy skin care products. From Facial Cleansers, Hand Creams, Lotions to Massage & Bath oils, we make natural skin care products to blend in everyday life. Rose Crown® is proud to introduce a series of skin care products formulated with Australian Ovine Collagen, a world-first patented collagen extracted from sheep of Australia. Recommended products like Herbal Hand Creams, Collagen Ultra Complex and Eye Renewal Cream have made a good reputation in the industry. Come and experience the joy of herbal aromatics while refreshing & hydrating your skin!